Emporia City administrative offices are located at 104 East 5th Avenue, Emporia KS 66801; phone: 620-343-4244. Photo: William Allen White House, ca. 1899, 927 Exchange Street, Emporia, KS. Listed on the National Register of Historic Places in 1971. Photographed by User:Dmadeo (own work), 2009, [cc-by-3.0 (creativecommons.org/licenses/by/3.0)], via Wikimedia Commons, accessed September, 2014. Emporia, the county seat of Lyon county and one of the principal cities of the state, is located near the center of the county and is 61 miles southwest of Topeka. It is an important railroad center, being at the junction of the Missouri, Kansas & Texas and the main line of the Atchison, Topeka & Santa Fe, and is the terminus of three branches of the latter system, one of which runs to Holliday, one to Chanute, and the other to Moline. It has waterworks, electricity for lighting and power purposes, police and fire departments, well paved streets, and a public library. A street railway is soon to begin operating its cars. Among the industries of the city are woolen and flour mills, foundries, machine shops, carriage and wagon works, ice plant, broom factories, a planing mill, creamery, brick and tile works, a corrugated culvert factory and a marble works. Emporia has 3 banks, 1 daily and 2 weekly newspapers, an international money order post office with ten rural routes, an opera house, telegraph and express service, and is an important mercantile center. The population in 1910 was 9,058. Emporia was founded in 1857, Preston B. Plumb being the principal promoter. Interested with him were George W. Deitzler. G. W. Brown, Lyman Allen and Columbus Hornsby. The first building was a boarding house erected by John Hammond; the second was the store of Hornsby & Fick, and the third was the Emporia House, the town company's hotel. In the fall the post office was moved from Columbia to Emporia and Mr. Fick became postmaster. The first number of the "Kansas News," later the Emporia News, was printed on June 6, 1857, in an upstairs room of the Emporia House while the printing office was being built. No gambling and no selling of intoxicating liquor was allowed, the penalty being the forfeiture of the property on which the misdemeanor took place. The growth of the town was brisk from the first. During the year 1857 and subsequent years before the war, a steady stream of settlers located in the town and in the surrounding country, new business enterprises were established, churches and schools were built. The town company encouraged improvement by setting aside a number of lots to be given to those who would put up buildings on them. A special act was secured in 1862 allowing Emporia to issue bonds to the extent of $6,000 to build a school house. When finished it was the finest in the state except one at Leavenworth. Seeing how successfully the plan worked this special act was made the basis of a general school law for the whole state. Emporia has always figured prominently in the educational matters of the state. 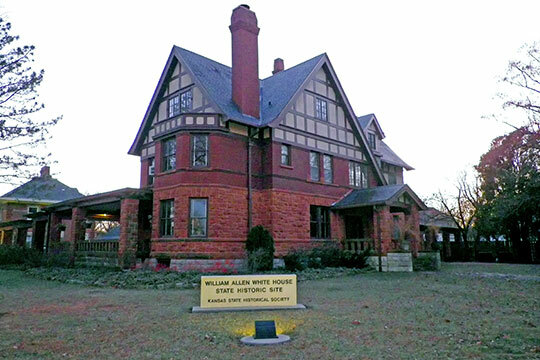 It is the seat of the state normal school and the College of Emporia; and is the home of the well known Kansas author, William Allen White. Frank W. Blackmar, A.M., Ph.D., Kansas: A Cyclopedia of State History Embracing Events, Institutions, Industries, Counties, Cities, Towns, Prominent Persons, Etc., Volume I, Standard Publishing Company, Chicago, 1912.